We’d love your help. 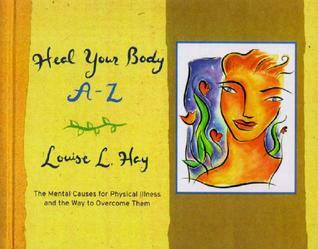 Let us know what’s wrong with this preview of Heal Your Body A-Z by Louise L. Hay. Arranged in an A-to-Z format, this step-by-step guide looks at the reader's specific health challenge, the probable cause for this health issue, and the information needed to overcome it by creating a new thought pattern. To ask other readers questions about Heal Your Body A-Z, please sign up. I would love to say that I believe in this stuff (there's a HUGE "but" coming) BUT while I do think there's some truth to the "mind over body" way of thinking, I don't think you can really wish away a cyst or cancer. I wish you could and I do think a positive attitude can go a long way but when I get sick I want to make sure I have a good, qualified physician taking care of me, not this book. Much more simplistic than I imagined, I nonetheless enjoyed this book. Hay essentially distills all ailments as falling into two buckets--expressions of anger or expressions of fear. “The mental thought patterns that cause the most dis-ease in the body are criticism, anger, resentment, and guilt." The idea is that you look to your physical ailments to give you clues about your emotional and psychological health. Hay offers up mantras to counter what your ailments reveal. A few of the ailments tha Much more simplistic than I imagined, I nonetheless enjoyed this book. Hay essentially distills all ailments as falling into two buckets--expressions of anger or expressions of fear. - Addictions: Running from the self. Fear. "I now discover how wonderful I am. I choose to love and enjoy myself." - Ankles: Inflexibility and guilt. Ankles represent the ability to receive pleasure. "I deserve to rejoice in life. I accept life's pleasures." - Anxiety: Not trusting the flow and process of life. "I trust the process of life. I love and approve myself." - Appetite, Excessive: Fear. Needing protection. Judging emotions. "It is safe to feel. My feelings are normal and acceptable." - Arms: Ability and capacity to hold life's experiences. "I lovingly hold and embrace my experiences with ease and joy." - Back, Lower: Fear of money, lack of financial support. "I trust the process of life. I am taken care of." - Back, Mid: Guilt, stuck in all the stuff back there. "I release the past. I am free to move forward." - Back, Upper: Lack of emotional support. Feeling unloved, holding back love. "I love and approve of myself. Life supports and loves me." - Bad Breath: Anger and revenge thoughts. Rotten attitudes, vile gossip, foul thinking. Experiences backed up. "I release the past with love." - Blood Pressure, High: Long-standing emotional problems not solves. " I release the past." - Asphyxia: Fear or refusal to take in life fulling. Not feeling the right to take up space or even exist. "It is my birthright to live fully and freely. I am worth loving. I now choose to live life fully." - Cellulite: Stored anger and self-punishment. "I forgive others and myself. I am free to love and enjoy." - Constipation: Refusal to release old ideas. Stuck in the past. Sometimes stinginess. "As I release the past, the new and fresh and vital enter. I allow life to flow through me." - Deafness: Rejection, stubborness, isolation. What don't you want to hear? "I listen to the Divine and rejoice at all that I am able to hear." - Diabetes: Longing for what might have been. A great need to control. Deep sorrow. No sweetness left. "The moment is filled with joy. I now choose to experience the sweetness of today." - Diarrhea: Fear, rejection, running off. "My intake, assimilation, and elimination are in perfect order. I am at peace wtih life." - Elbow: Represents changing directions and accepting new experiences. "I easily flow with new experiences, new directions, new changes." - Emphysema: Fear of taking in life. Not worthy of living. "It is my birthright to live fully and freely. i love life. I love me." - Astigmatism: "I" trouble. Fear of really seeing the self. "I am now willing to see my own beautify and magnificence." - Myopia: Fear of the future. "I accept divinve guidance and am always safe." - Fat: Oversensitivity. Represents fear and a need for protection. Cover hidden anger and resistance to forgive. "I am protected by Divine Love. I am wiling to grow up and take responsibility for my life. I forgive others and create the life I want." - Fat Arms: Anger at being denied love. "It is safe for me to creat all the love I want." - Fat Belly: Anger at being denied nourishment. "I nourish myself with spiritual food, and I am satisfied and free." - Fat Hips: Lumps of stubborn anger at the parents. "I am willing to forgive the past. It is safe for me to go beyond my parents' limitations." - Fat Thighs: Packed childhood anger; often rage at the father. "I see my father as a loveless child, and I forgive easily. We are both free." - Feet: Represents our understanding of self and others, life. "My understanding is clear, and I am willing to change with the times." - Gum Problems: Inability to back up decisions. Wishy-washy. "I am a decisive person." - Gas: Gripping. Fear. Undigested ideas. "I relax and let life flow through me with ease." - Indigestion: Gut-level fear, dread, anxiety. Griping and grunting. "I digest and assimilate all new experiences peacefully and joyously." - Joints: Represent changes in direction in life and the ease of these movements. "I easily flow wtih change. My life is Divinely guided." - Knee: Pride and ego. Inflexibility; inability to bend. Fear. Won't give in. "I am flexible and flowing. Forgiveness. Understanding. Compassion." - Left Side of Body: Receptivity, feminine, taking in, women, mother. "My feminine energy is beautifully balanced." - Neck Problems: Refusing to see other sides of a question. Stubborness, inflexibility. "There are endless ways to do and see things." - Psoriasis: Fear of being hurt. Deadening the senses of the self. Refusing to accept responsibility for our own feelings. "I am alive to the joys of living. I deserve and accept the very best in life. I love and approve of myself." - Insanity: Fleeing from the family. Escapism, withdrawal. Violent separation from life. "This mind knows its true identity and is a creative point of Divine Self-Expression." - Right Side of Body: Letting go, giving out, masculine, father, men. "I balance my masculine energy easily and effortlessly." - Round Shoulders: Carrying life's burdens. Helpless and hopeless. "I stand tall and free. I love and approve of me. My life gets better every day." - Skin Problems: Anxiety, fear. Old, buried guck. I am being threatened. "I lovingly protect myself with thoughts of joy and peace. The past is forgiven and forgotten. I am free in this moment." - Snoring: Stubborn refusal to let go of old patterns. "I release all that is unlike love and joy in my mind. I move from the past into th enew and fresh and vital." - Sore Throat: Holding in angry words. Swallowed anger. Stifled creativity. Feeling unable to express the self. "I release all restrictions, and I am free to be me." - Stiffness: Rigid, stiff thinking. "I am safe enough to be flexible in my mind." - Stomach Problems: Dread, fear of new, inability to assimilate the new. "Life agrees with me. I assimilate the new every moment of every day." - Teeth Problems: Indecisiveness, inability to break down ideas for analysis and decision. "I make decisions based on principles of truth, and I rest securely knowing that only right action is taking place in my life." - Varicose Veins: Standing in a situation you hate. Discouragement. Feeling overworked and overburdened. "I stand in truth and live and move in joy. I love life and circulate freely." - Wrist: Represents movement and ease. "I handle all my experiences with wisdom, love, and ease." Everything -good or bad- starts with our thoughts. Feeding our heart and mind with the right thoughts can make a huge difference. Love is all we need. This is a great, easy to access book if you are looking into alternative approaches to health and wellness. It's based on metaphysical philosophies of health and disease (dis-ease). I highly recommend it if you are looking to improve your quality of life, better understand your body, and are able to keep an open mind. This is such a great reference tool. I'm a massage therapist and energy worker, and when I introduce clients to the idea that emotions could be contributing to their physical health, it's a powerful thing! A must have for any Lightworker, Bodywork, Massage Therapist, Reiki Master, etc. Be advised: this is set up as a reference book. There are some instructions at the beginning, then most of the rest of the book consists of charts of various symptoms. 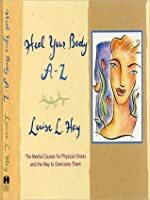 I enjoyed reading Heal Your Body A-Z as I use self-healing for myself. When I purchased the book it was via a friend and the book basically confirmed to me, that I was healing my body in a similar way Louise Hay healed herself. I believe if you follow her book and carry out her advice anything is possible. While some of what this book proclaims make sense, it’s a bit problematic for me in several areas. I think, for starters, it’s a simplification. And when I saw that “death” was listed as something you could cure with your thoughts, it was hard for it to keep credibility for me. There are better Louise Hays books to read. A love the book but it does not give much detail. It's a great book to read but it lacks detail. I would have loved for her to get into the detail of why & how. I get the message she is trying to drive though. This book is helpful to those seeking to be healed in a natural way. Not every will agree to what Louise is saying but if you do the mental work you will find out what she's saying is right on point! - A great reference guide for all types of ailments in your body. - I use it all the time, to remind myself of the mantras and it works! Disease does start from the emotional body and once we can heal that, the body heals itself. If you believe in the power of the mind to heal, this is the book for you. You will be amazed at how spot on the author is with the reasons for your illnesses, and if you repeat and believe the affirmations, they will work miraculously. If you’ve practiced mirror work you’d probably find this a bit useful. A must for anyone who wants the mental reason for physical issues. I gave it 3 stars because it is too short. I thought I was buying the full version. It’s a good reference for dis-ease and matching affirmations. :) There is a short meditative message you can read at the end to help aid healing. An interesting starting point to determine the metaphysical connections of many ailments. Contains many positive affirmations specific to the ailment. This book was suggest to me by my daughters therapist. I love it! It has some very interesting information in it. Even if you are not "new age" minded it will give you a great deal to think about. It connects feeling and psychology to physical ailments. We are finding out more everyday that this type of science has merit. I am a very logical and science fact based person and this book still spoke volumes to me. Very interesting stuff. I looked up my ailments and saw a very distinct pattern of alleged thought processes that made perfect sense for me. In my case (according to her ailments and their causes) I don't trust the universe, have a hard time letting go of the past, and harbor a lot of anger and resentment. I'd say that's extremely true. I think this book is a great guide and tool for getting one thinking more positively! The first place I or someone I know has an ailment. This book really helps illustrate the mind/body connection. I often find that the spiritual meanings make a lot of sense. I've not had much success with using the suggested affirmations to correct the problems--but that's my fault because I haven't put in the effort of saying them. Overall, a very interesting book and a must-have for the spirit junkie's library. I liked that you could jump straight, find problems that are ailing you most, and begin to heal them immediately. For future readers, I say open your mind and take in what the author has to say. I recommend this book. I think I checked out a summary edition of this book two years ago and thought it a joke. Somehow I came across the full version and actually found it very interesting this time. I guess I not as narrow minded as last time I looked at it. Heh. 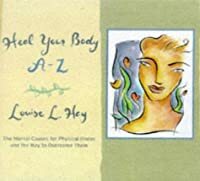 This book has the listing of diseases and metaphysical causations that Louise's little blue book contains, but the feel of the book is much richer. The tactile experience is far superior. I much prefer this book. I have a hard time believing anything I just read but hey, I've heard of odder things that happened. Take it for what this book is worth. Louise Hay is one of my faves though. She is a warrior and her affirmations are so sincere. I'm not big on self help mumbo jumbo, but I can honestly say this book opened my eyes to many things. I am using a few of the affirmations and I already see a positive change in me. I would suggest everyone read this.. It may just make the world a better place.